We develop accurate and reliable photovoltaic (PV) performance characterization technologies and PV reference device calibration technologies, contributing to the improvement of international competitiveness and mass deployment of PV technologies through the establishment of international conformity of the calibration and measurement technologies. We develop precise PV calibration and performance measurement technologies of PV devices, which directly contribute to the value of PV, and confirm and establish the international conformity of these technologies through the proficiency tests and international comparison measurements. We also supply PV reference cell calibration to the PV community and measure a wide variety of PV devices from PV manufacturers. The measurement and calibration technologies developed in the research activities are actively disseminated through standardization such as JIS and IEC. Precise and reliable performance measurement technologies for various types of novel PV devices (Fig. 1) are continuously developed. 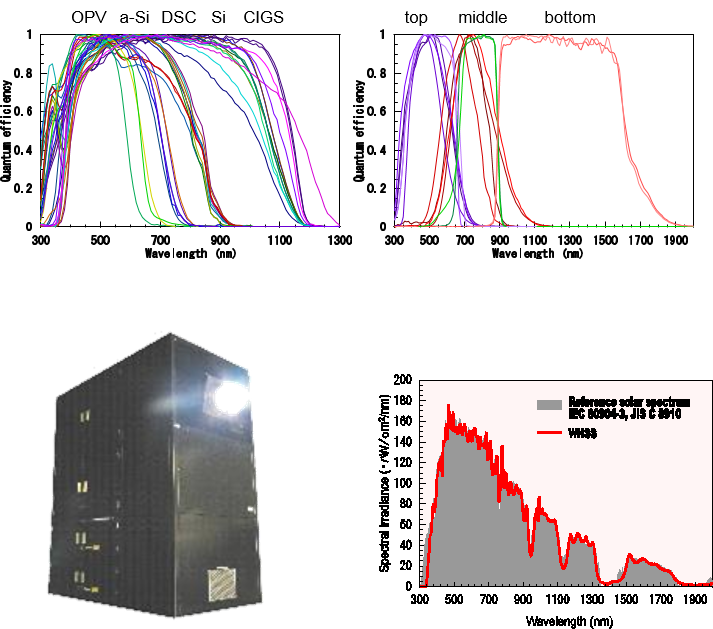 In our group, we measure PV performance of those devices under standard test conditions (STC) as well as practical outdoor conditions such as varying device temperature, irradiance, and spectrum. We also perform PV performance measurements of state-of-the-art PV devices developed in PV industries and research institutes. To confirm the technological conformity of the PV performance measurement technologies, proficiency tests and inter-comparison measurements among domestic/international testing laboratories are performed. Due to wide spreading of PV systems, outdoor performance characterization and monitoring technologies available and useful for the system operations & maintenance (O&M), become increasingly important. In our group, fast and precise outdoor measurement technologies including IV correction methods, which meet a demand from the PV community, are investigated. and spectral irradiance of a wide-range high-fidelity solar simulator (bottom right). We are conducting research related to the development and improvement of calibration technology of reference PV devices used for accurately measuring the irradiance of natural sunlight and solar simulator. We were registered as ISO / IEC 17025 accreditation laboratory (IAJapan ASNITE 0021C) according to international mutual recognition arrangements (MRA) for ILAC and APLAC. Since September 2009, we are conducting by solar simulator method as AIST request test. In addition, utilization of ultra-high-temperature fixed-point blackbody furnace, development of a high-speed spectroradiometer with extremely small nonlinearity error, and performance verification of absolute cavity radiometer with refined internal optical system by participating in International Pyrheliometer Comparison (IPC) to improve calibration and measurement capability of us (Fig. 2). We have contributed from the beginning as an organization of the Qualified Laboratory, which has only four institutes worldwide, to maintain World Photovoltaic Scale (WPVS) which is the key comparison reference value of the primary calibration value of reference solar cell. We also provide reference values for proficiency test and inter laboratory comparison conducted according to the requirements of ISO / IEC 17043, and are cooperating in performance evaluation and accreditation acquisition activities of domestic and overseas calibration laboratories and institutions (Fig. 3). Fig. 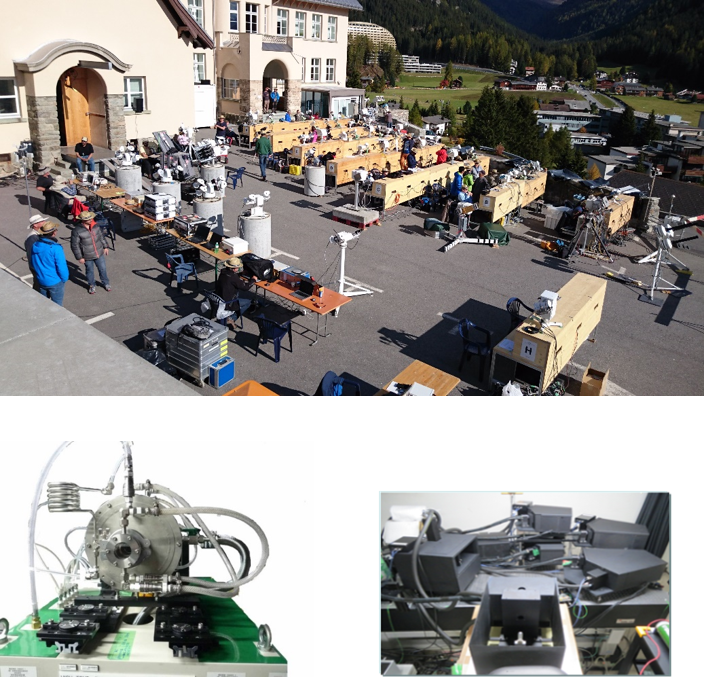 2 International pyrheliometer comparison at PMOD/WRC in Davos, Switzerland (top), Ultrahigh-temperature fixed point black body furnace (bottom left), high-speed spectroradiometer with extremely small nonlinearity error (bottom right). Fig. 3 WPVS qualified laboratories (left) and framework of international mutual recognition agreements for ILAC and APLAC (right).